Peridot is known as the "evening gemstone" because its color intensifies in the evening light. 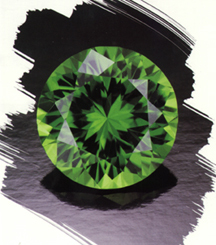 The gemstone's color range includes yellowish-green, bright green and pleasant olive hues. Though Peridot is suitable for everyday wear, care should be taken to protect it from scratches, sharp blows and extreme temperature changes. Remove Peridot when engaging in activities such as housework, gardening or very active sports. Avoid home ultrasonic cleaning. While today we are not limited by tradition, the symbolism of Peridot is treasured as the birthstone for August and celebrating the sixteenth anniversary. It has long been associated with spring and renewal.